We’ve been working in higher education for more than a decade. Our clients have included private and public colleges and universities, education and student advocacy groups, and an education PR firm. Many schools and businesses think of their websites like Kevin Costner thinks of baseball fields – if you build it, they will come. Most of the time, however, their websites need a little help. That’s where content marketing comes in. 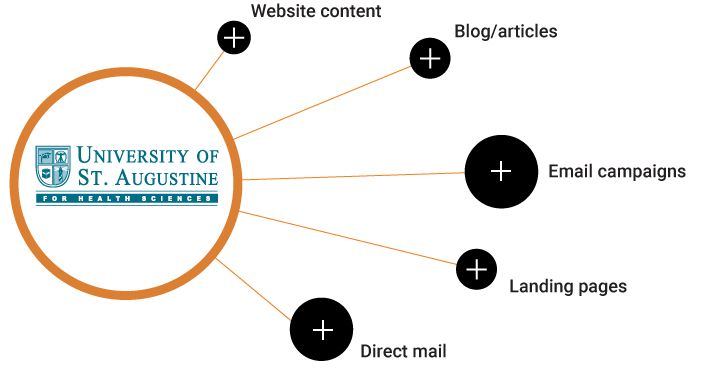 Content marketing in education involves using as many channels as needed to capture a prospective student’s interest and drive her to your website where you hope she’ll identify herself and request more information. Content marketing can be used to communicate with prospective students you already know – email announcements alerting them to your blog posts and newly published articles, for example. It can also be used to initiate contact with prospective students you don’t know – a strategically search-optimized article or blog entry on your website, for example, can capture new leads through search engine listings.